Here are a couple of videos of the twins! 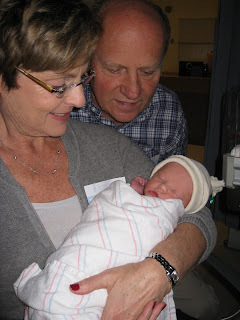 The other crying you hear in the background is Ava - two minutes old. 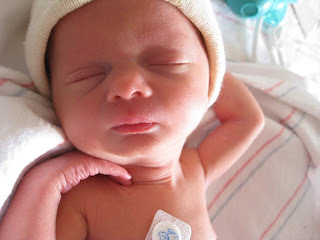 Everyone is doing well... taking some formula and lots of naps. 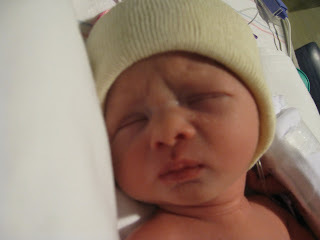 Ava checking out her surroundings. Ava stretching out under the warmth of the heat lamp. 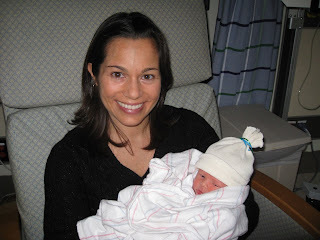 Colin gets a visit from Kristin. 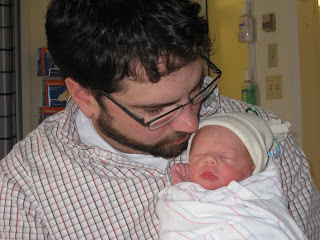 Welcome Colin Andrew and Ava Katherine to the world! 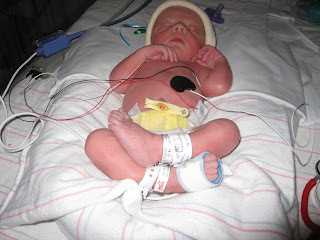 Everyone is doing well, the babies are doing fantastic especially considering they are a couple weeks early. Mom is resting and enjoying medication for a few days. 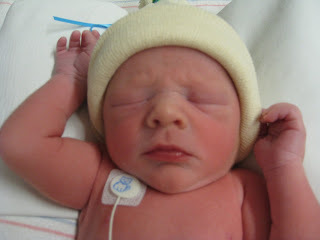 It was a long night, lots to tell... but for now how about some pictures? 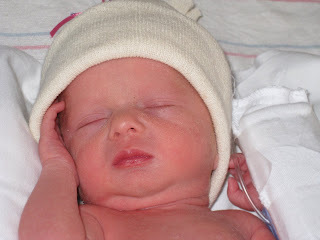 Ava is the younger sister by about two minutes... she weighed in at a svelte-but-healthy 3.5lbs. She is very delicate. 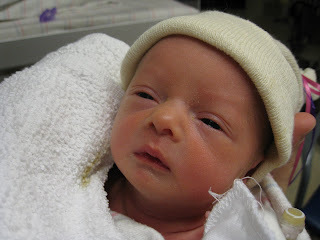 Opening her eyes a little to look at mom. Unlike concerned Ava, Colin just chills. He coos and just makes himself comfortable. 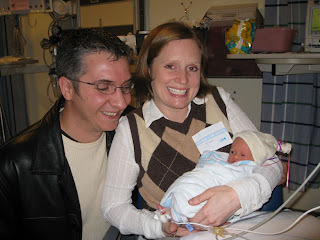 Dad meets Colin, and helped him with his first taste of bottle. Everyone will continue to gain strength and operate under their own power. Hopefully we'll all be able to go home in the next few days if everyone does well. 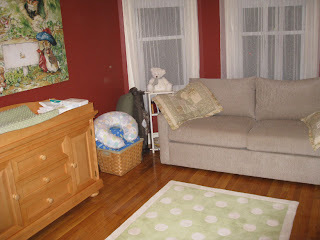 The nursery is complete and awaiting the upcoming arrivals! Final projects were the mural, which came out great, and a dimmer switch for the overhead light... all done! 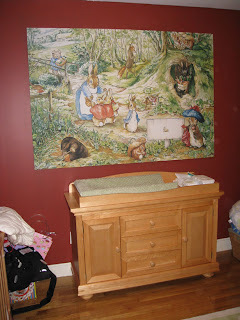 The mural was from muralsyourway.com - it is A Walk in the Wood by Beatrix Potter.. the old Peter Rabbit books. It came in two canvas sheets. It was quite a project. We bought some luaun plywood (thin, light plywood) and prepped that first by gluing and nailing two woooden "runners" along the top and bottom of the back. These runners provide stability for the plywood and give a location to mount the necessary hangers on the back - the plywood would be too thin for that. Then, we sanded it all down so it was nice and smooth, and primed the front with Killz primer. After that dried we were ready with our heavyweight wallpaper paste.. we spread that on 1/2 of the wood and layed down canvas #1, brushing out any bubbles with a wallpaper spreader and measuring the overlaying edges to make sure it was even. We then quickly did the 2nd canvas, lining up the center overlap so that it was as "seemless" as possible. We let that dry for a day or two before turning it over, pasting the edges of the back, and wrapping the canvas around the sides to create a "stretched canvas" look. After that dried, we simply glued down the overlapped part in the middle, mounted D-rings on the back and ran heavy-duty wire across. Two mounts on the wall for the wire to hang on and voila. That was easy... right? 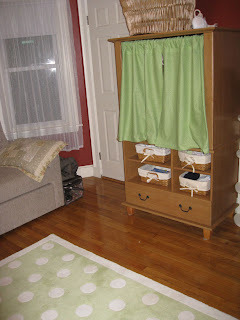 The armoire is a converted TV stand - we took all shelves out and added curtains and rods to hang clothes in the top and lined baskets for other items in the bottom! 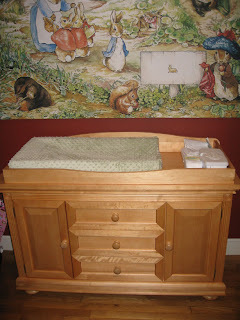 The dresser, mural, and rug were a gift from the future babies' Grandparents! THANKS! 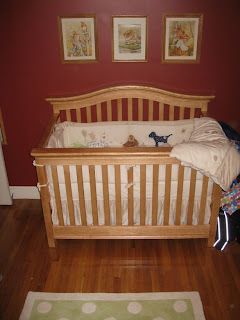 And the crib was a gift from the future babies' OTHER Grandparents! THANKS! Wow we are really getting into the home stretch now... we are moving all around, fighting for position, and getting big! 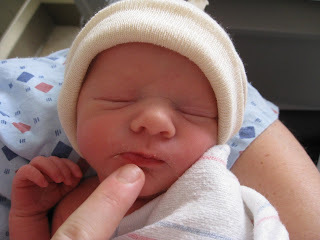 According to thenestbaby.com, our energy is surging, thanks to the formation of white fat deposits beneath our skin. Also this month, all five senses are finally functional, and the brain and nervous system are going through major developments. Yay, us! Ok also, this thing (below) is wrong! It says ONE of us would be between 2.5 and 3.8lbs, but there are TWO of us in here, and they estimate that one of us is 3.5lbs and the other is 3.9! 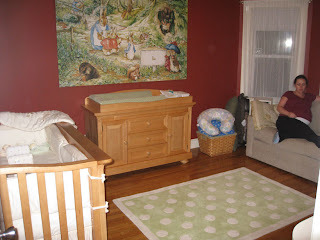 Our nursery is all set... just waiting for a few last things. 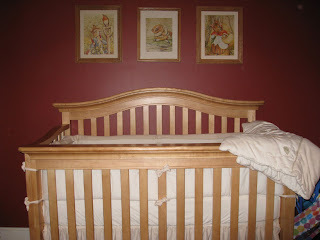 We'll post some pics of our baby room soon! See ya later! Is that part of your costume? 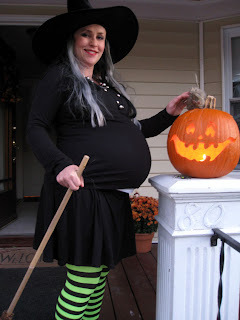 A pregnant witch? I'm sure the cute will win in the end.